Tom runs his eyes over the best defenders from this year’s draft crop. As we turn our eye to Fantasy 2019, Tom has been looking at all of the draftees throughout the season and shares his watch-list for the upcoming season. Today he profiles some defenders to keep an eye on over the pre-season. Click here for the midfielders. Clarke was an Australian opening bowler before he decided to narrow in on a football career. Western Australia’s highest rated talent, the Claremont product is a composed small defender who reads the ball well, allowing him to drift in and take intercept marks. Clarke also has sound foot skills and is clean at ground level, possessing the capacity to progress into the midfield in the future. Geelong would have been wrapt when Clarke ‘slid’ down further than anticipated, allowing them to pounce at pick 15. He averaged a combined 70 points, playing all four championship games for WA and managing to play five senior WAFL games with Claremont. Learning the ropes from the likes of Tom Stewart down on Victoria’s great ocean road, Clarke has the senior exposure, endurance and may only be required to add a couple of kilos in order to make an impact early. Can play from round one. 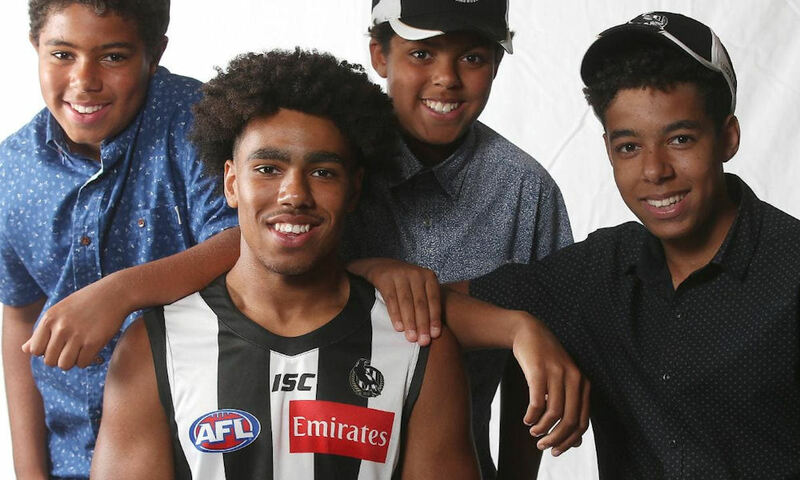 Collingwood happily matched the Port Adelaide bid when it came for Next Generation Academy member Isaac Quaynor. Of African heritage, Quaynor is a two-way defender in that he can perform a lock-down role on his opponent and also provide a source of rebound from defence. These traits are critical in modern football. Having worked in relatively close association with the Magpies for a number of years now, Quaynor will have learnt of the prerequisites in order to succeed at AFL level. He is a smart player with strong all-round athleticism – his leap being of particular notice. Quaynor, who averaged 62 fantasy points in 16 games, has the ability to slot straight into the Pies defence and perform a team-orientated role from day one. Port Adelaide traded up to pick five, hoping one of the top South Australian trio was still on the board. They would be ecstatic to land North Adelaide SANFL premiership winner Connor Rozee, a super athlete capable of playing almost anywhere on the field. Not only did he shine at state league level, Rozee’s performances at the Draft Combine were terrific, recording a 88cm running leap, 2.91 20m sprint and 8.32 second agility test, highlighting his athletic prowess. Although Rozee may not have produced big scores in his top-aged year, he has grown accustomed to plying his trade against the men and, therefore, a large amount of his fantasy appeal lies with opportunity. The Power would love him to come straight in and fill the roles left by the likes of Polec and Pittard, however he will need to add size to his skinny frame to cope with the next step up. Not many draftees would enjoy the Gold Coast environment as much as South Australian Jez McLennan. A surfer, McLennan stared for SA at the Under-18 Championships as an intercept marking defender. Although he didn’t win a heap of the ball for state and club (averaged a combined 12 disposals and 59 points), his composure, ability to read the play and ball use were exceptional and resulted in him being named All-Australian. With a well-developed frame, exposure to senior SANFL football and an AFL-level endurance base, McLennan should play games for the Suns next season. Certainly one to monitor. Marty Hore was always rated as one of the State Leagues best defenders and, therefore, often spoken about as having a potential AFL suitor. The Demons, who last year drafted Bayley Fritsch and Oskar Baker from the VFL and NEAFL respectively, once again tapped into the state leagues, drafting the Collingwood defender with pick 56. Hore is a great size at 190cm, which allows him to act as an intercept marking backman, but also distribute the ball well by foot. Having enjoyed a standout season in the VFL, where he won the clubs B&F for the second consecutive year, Hore averaged 20 disposals, 7.5 marks and 86 points. If a Demon defender goes down, Hore is a more-than capable backup in defence. Callum Wilkie was one of the driving forces behind North Adelaide’s remarkable SANFL Premiership triumph, the consistent 22 year-old taking out the best and fairest. Wilkie is able to play on a wing and spent time as a forward in his junior years, however looks set to slot into a role down back, where his football smarts, ability to read the play and foot skills are exemplified. Listed by St. Kilda with the third selection of the rookie draft, Wilkie could very easily transition straight into the side from round one and provide us with a basement priced Fantasy option, after he averaged 25 disposals, 8.6 marks and 108 points in 22 games for the Roosters.